Regardless of if you are on a hiking trip to the mountains, lounging in your back yard, backpacking camping with friends, or enjoying a sunset you want to do so in comfort and style! That's why we created the OpenWorld Outfitters Parachute Hammock made with extremely lightweight and durable High Density Nylon. Produced and tested by active Military Members that enjoy adventure as much as the next person, this Hammock is exactly what any outdoor lover needs! All you need to set up your Hammock and enjoy the view comes in an attached compression pouch for easy storage and packing into your backpack. After setting up this Hammock one time you will be a pro! Our Parachute Hammock is so lightweight and compact you have no excuse not to take it with you! Include this Hammock in your travel kit and never miss the opportunity to stop, rest, relax and take in nature; get the OpenWorld Outfitters Ultralight Backpacking Tarp and never get caught unprepared. Click 'Add to Cart' now to get the perfect backpacking, camping and outdoor hammock that you can take with you wherever you go! 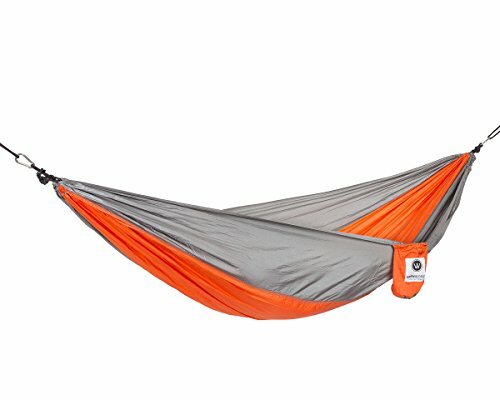 COMPACT & LIGHTWEIGHT: This Hammock stores in a 3.9x7.5in bag that fits easily into most day packs or it can be compressed easily to fit into your heavier packs for longer trips. DURABLE: This Parachute Hammock will hold up to all types of weather! It has been tested in many different climates exceeding expectations! Our Hammock is Water Resistant & Durable. Our Hammock is made from High Density Nylon, including solid steel carabiners. OpenWorld Outfitter's Hammock will pass the test. GREAT GIFT: OpenWorld Outfitter's Parachute Hammock is great for all ages! Anyone that enjoys being in the outdoors would enjoy this Hammock as a gift for any occasion! Every product is backed by superior quality and reliability, as well as a true satisfaction guarantee for quality assurance.